We hope you had a very enjoyable Thanksgiving weekend. We certainly did. The recipes were varied in their success. The standard stuff was all very good. The turkey in the bag, excellent as usual. Mom's stuffing recipe was the star as it always is and the potatoes were fluffy and warm. The Banana Cream recipe called for two boxes of vanilla pudding and I subsituted one box of vanilla and one box of banana cream. That was a mistake. The banana cream pudding has an artificial taste that the pies could have done without. Next time I'll stick with vanilla or make my own. The Apple stuffed Acorn squash had an excellent flavor with the sweetness of the squash mixed with the spices. The only change I will make next time is to saute the apples before stuffing the squash. I think it would have been better had the apples been soft but they were kind of crunchy. Put all in Crock Pot, stir well and then cook 2 to 3 hours on high until liquid is syrupy. Refrigerate until you are ready to serve. It will be runny when it's hot but thickens up beautifully when cold. Last week I mentioned how much I appreciate our loyal newsletter subscribers. My hope is that each time you open one of these newsletters, you find our easy-to-make recipes and simple party planning tips helpful as you plan your own home parties. 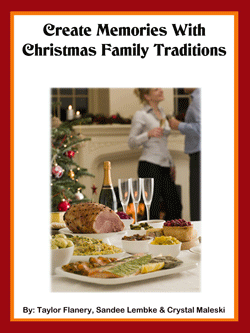 I just finished publishing a small ebook with two of my friends entitled, "Create Memories With Christmas Family Traditions." As a token of my appreciation, I am offering you this free ebook to read and share with friends and family. I think you will find it to be helpful during this holiday season. In this ebook we share some of our favorite holiday Christmas family traditions we have established with our families over the years, tips on making your own natural decorations and centerpieces, unique gift wrapping techniques and some edible homemade gift ideas you can easily make in your kitchen.